For those interested in exploring the presence/absence of intestinal parasites in a gut microbiome context, Dr Mark van der Giezen and I did this small opinion paper for Trends in Parasitology. In it, we summarize data from studies looking at the associations between single-celled intestinal (luminal) parasites and gut bacteria, and we tried to come up with a hypothesis for the factors governing the presence/absence of e.g. Blastocystis. The paper just appeared online, and you can access it here. I'm actually going to skip the small review I do each month for a variety of reasons. Instead, I'm just going to upload a presentation I gave in Tilburg, The Netherlands, a bit more than a week ago, before attending the UEG Week in Barcelona. I uploaded it to Google Drive, hoping that it will be easy to download for everyone interested. I have not included any notes, hoping that the slides will be pretty much self-explanatory. I think there is even a bit of Danish in there, - hope you don't mind! Also, the preview option does not work very well, so make sure you download it. If the presentation left you wondering a bit and wish for more, why not look up my publications listed in PubMed? They are available here. Some of them can be downloaded for free. One of the current mantras in microbiology is that 'bacterial cells in the human body outnumber human cells 10 to one'. This has been known for a long time, but I guess that the main reason why this is being hyped nowadays is due to the fact that current technologies now enable us to look at entire microbial communities in a given ecological niche at any time point and how for instance they relate to health and disease. Casadevall and Pirofski already made this point clear back in 2000 in their great minireview in the journal Infection and Immunity on 'Host-Pathogen Interactions: Basic Concepts of Microbial Commensalism, Colonization, Infection, and Disease'. This is a great paper that helps us understand and distinguish between the many ways microbes impact on our body. First and foremost, it allows us to understand that microbes can be commensals in some hosts but cause disease in other hosts, and that very few microbes are obligate pathogens. 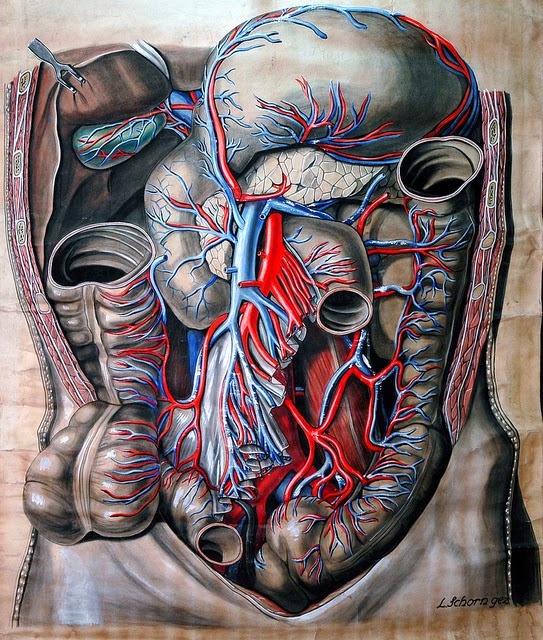 Anatomical drawing of abdomen, ca. 1900 (Elisa Schorn). Source. Commensalism is defined by these authors as 'a state of infection that results in either no damage or clinically inapparent damage to the host, though it can elicit an immune response'. And a commensal is a 'microbe that induces either no damage or clinically inapparent damage after primary infection; a state that is thought to be established early in life'. In terms of the antibody response, 'it is not known whether these immune responses reflect the occurrence of an unidentified form of damage to the host'. Importantly, 'commensals also synthesise metabolites that are essential nutrients for the host'. According to Casadevall and Pirofski, colonisation is 'a state of infection that results in a continuum of damage from none to great, with the latter leading to the induction of host responses that could eliminate or retain the microbe, or progress to chronicity or disease; for organisms that induce no damage during infection this state is indistinguishable from commensalism'. I guess that to this end comes the concept of tolerance...Some single-celled parasites are common in young mammals such as calves and lambs (for instance Cryptosporidium and - it appears - microsporidia (unpublished data)), but appear to be cleared by host immune response mechanisms, while other parasites are establishing chronic colonisation, - parasites such as Entamoeba and Blastocystis. The latter parasites may also colonise humans for years on end... So why do we not eliminate these parasites? Blaser writes back in 1997: 'Failure to eliminate the parasite implies that the cost to the host is greater than the benefit. This may be due to high costs (e.g., loss of vital (...) functions), or significant benefits (e.g., protection against lethal diseases), or that both cost and benefit are relatively low'. In Blastocystis research most scientists appear to be preoccupied by identifying a role for Blastocystis in disease, driven by the black and white concept that either it's pathogenic or not... or at least that if it can cause disease, it's by definition a pathogen! I think the paper by Casadevall and Pirofski shows with great clarity why we should try and take a much more differentiated view on Blastocystis and it's role in health and disease. As mentioned in a previous blog post, Blastocystis is practically an obligate finding in some societies, while more rare in others. In some communities it may be common to contract it in very early childhood (infants/toddlers), while in other communities you may not be infected or infected only in adulthood. In Denmark, the prevalence in the healthy adult population is about 30%, and there may be countries where the prevalence is even lower - typically in regions, where the general population has been 'intestinally defaunated' (presumably due to excessive hygiene combined with a Westernised diet). And so, in some places this parasite is getting so uncommon that it may at some point become a cause of disease, a so-called 'emerging pathogen'... Conjectural maybe, but still not far fetched. Simultaneously, evidence is emerging that intestinal microbial eukaryotes (Blastocystis and Dientamoeba fragilis) are significantly more common in healthy individuals than in patients with gastrointestinal disease such as IBS and - especially - IBD, suggesting that these parasites are protective of functional and organic bowel disease. Do they prime our immune system in a beneficial way? Do they select for beneficial bacteria? Do they keep potential harmful microbial intruders at bay? Could they be synthesising metabolites beneficial to the host just like ciliates involved in fermentation processes in the large intestine of various herbivorous mammals? 1) The distribution of pro- and eukaryotes is random (for instance: Blastocystis is not statistically associated with the presence of particular bacteria or other eukaryotes (fungi, parasites)). 2) The introduction of a Blastocystis strain into an intestinal microbial niche does not cause alteration of the composition of the pro- and eukaryotic flora. This can be studied using an animal model, and it is tempting to try and study host immunological parameters during and after challenge with Blastocystis. Also gene expression in both host and microbial communities could be studied. Take home message is that we should be cautious with regard to deeming a parasite as being either 'pathogenic' or 'non-pathogenic'... parasites may have a multitude of functions and may impact their hosts in a variety of ways that together with all other types of impact from and interactions with other microorganisms (microbiota) results in a health/disease matrix in every single individual. Finally: Here's to pageview # 200,000! See you in Boston on Sunday morning at the #ASM2014 conference: Passion for Parasites !